Assign users to the content is done via Users module. 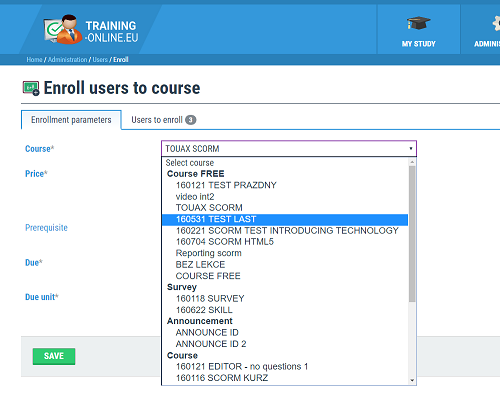 Just select the user(s) and user the Enroll to Course function, an Enrollment window will appear, where select the Course or other Contents or Learning plans. Select the course, then prerequisite if required to be completed before the course you just enrolling. Set the Due Dates and Repetition if required. Finish the enroll by SAVE button. The course will appear on assigned user(s) My Study page and since then is ready to be Entered. It's so easy! Edited 2 time(s). Last edit at 02/19/2017 05:54PM by admin_admin.